Prager, a veteran ocean scientist with extensive experience working under the sea, feels passionately that, especially in light of the disaster, we need to recommit to investment ocean research and technology. And she should know a thing or two about what it takes to make science happen on the ocean. Her book, Chasing Science at Sea: Racing Hurricanes, Stalking Sharks, and Living Undersea with Ocean Experts takes reads under the waves to see what life is really like for those who spend their life on the brine. To the average office-dweller, marine scientists seem to have the good life: cruising at sea for weeks at a time, swimming in warm coastal waters, living in tropical paradises. But ocean scientists who go to sea will tell you that it is no vacation. Creature comforts are few and the obstacles seemingly insurmountable, yet an abundance of wonder and discovery still awaits those who take to the ocean. 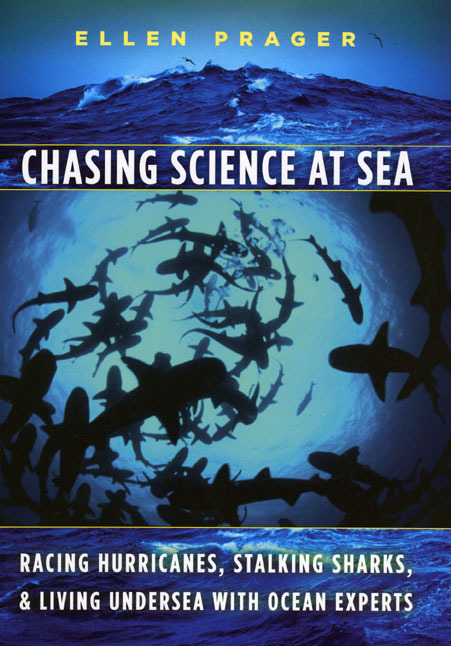 Chasing Science at Sea immerses readers in the world of those who regularly go to sea—aquanauts living underwater, marine biologists seeking unseen life in the deep ocean, and the tall-ship captains at the helm, among others—and tells the fascinating tale of what life—and science—is like at the mercy of Mother Nature. With passion and wit, Prager shares her stories as well as those of her colleagues, revealing that in the field ingenuity and a good sense of humor are as essential as water, sunblock, and GPS. Serendipity is invaluable, and while collecting data is the goal, sometimes just getting back to shore means success. But despite the physical hardship and emotional duress that come with the work, optimism and adventure prompt a particularly hardy species of scientist to return again and again to the sea. Filled with firsthand accounts of the challenges and triumphs of dealing with the extreme forces of nature and the unpredictable world of the ocean, Chasing Science at Sea is a unique glimpse below the water line at what it is like and why it is important to study, explore, and spend time in one of our planet’s most fascinating and foreign environments.